Getting back into the university study routine can be a bit of a challenge, even more so if you're just starting out at university. Even if you're in college or school, these are tips that have helped me since doing GCSEs so they are tried and tested! 1. Core textbooks are essential. This may only apply to uni students, but obviously textbooks are vital to studying and whilst the core textbooks are often available in the library, I find that I much prefer having my own copy I can annotate and use whenever I want. Sometimes textbooks can only be borrowed for a really short about of time, and if there are a lot of people on your course you may be left without having a book to read. Textbooks don't have to be expensive, some older students may sell some and they're often available for a lot cheaper online. 2. Go through your class notes as soon as possible. Not only does this help to make you remember more, but reading through them you might see that they need adding to or writing up in neater copies. Doing this always helps me to see where I need to add to my knowledge and what I really understood and really didn't understand! 3. Keep everything organised. I like to use refill pads to write my notes on and then file them into lever arch folders with printed lecture slides and course outlines. This may not be relevant if you're in school, but keeping this neat, tidy and organised helps so much when it comes to revising for tests and exams and writing essays. 4. Write titles and key points in different colours. By doing this it really breaks down your notes into more manageable chunks and makes key things stand out. Colour really does help with studying, whatever kind of learner you are. 5. Linked on to the previous point, is that highlighters and coloured pens are pretty essential! Not only for making things look pretty, and annotating notes but also for revision as nothing stimulates the brain more than bright and pretty colours. 6. Study cards and post-it notes are perfect for summarising. As well as using study cards to make flash cards, I like to summarise my notes onto them when it rolls round to exam season so I can easily revise wherever I am. Plus the small space makes you really think about the important bits and waffley bits. I always use post-it notes to make notes of keep points in textbooks and then just stick if over the page. That way I can quickly see what's important without having to read the whole thing again. 7. Start revision early. This is something I didn't do so many times and instantly regretted it. It's never too soon to start revising, and often it's useful to start early because then come exams you're not overwhelmed with having to relearn things you learnt way back at the start of the year. 8. Organise your time. Studying is important, but you need to make sure that you organise your time effectively so you have enough time to socialise and relax as well. Getting the balance right can be tricky but it's oh so important to spend time with friends and family, as well as having some time to yourself and studying. 9. Assignments are less daunting the sooner you start them. The closer it gets to the deadline the more stressed you'll feel, so as soon as you can start researching and planning how you're going to go about your assignment. Plus it's nice to finish a piece of work quite a bit before the deadline so you can read over it and make any changes needed without stressing and worrying. 10. Always do set reading. May not be the most exciting thing, but lectures and work will make so much more sense if you reading that your lecturers have set for you to do. After all it's set work for a reason. Hopefully these tips will help if you're starting something academically new, or if you're in need of some study motivation. 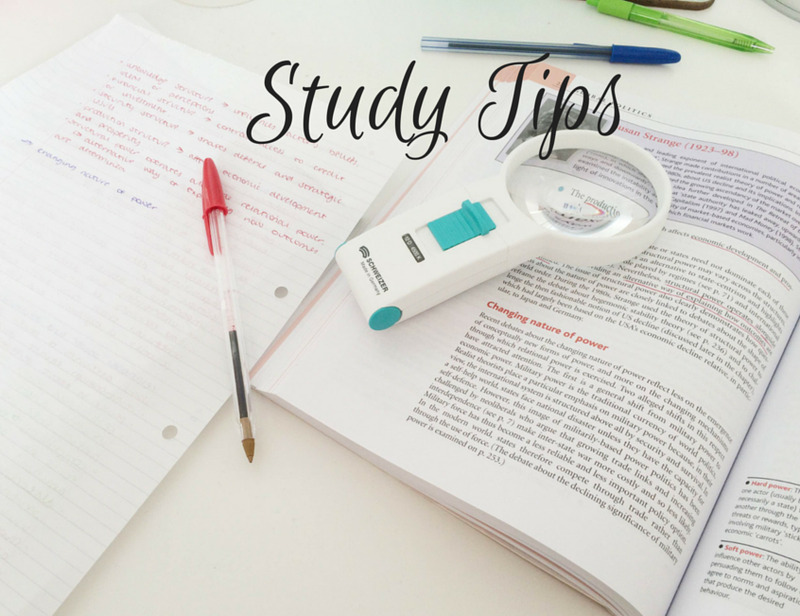 What are your top study tips?